Personnel: Evan Parker: tenor saxophone; Craig Taborn: keyboards, electronics; Dave Holland: upright bass; Ches Smith: percussion. Everyone into jazz knows about the extreme versatility of English bassist/composer Dave Holland, an extraordinary bandleader and valuable sidemen. The ability and competence to play in a variety of settings - from post-bop to free jazz and from solo to big band - with a voice of his own are remarkable. 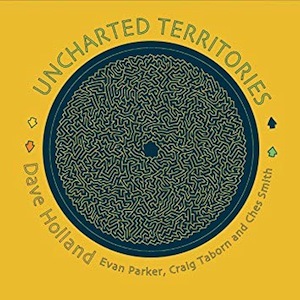 For his new quartet recording, Uncharted Territories, Holland teams up with the adventurous English saxophonist Evan Parker, inventive pianist Craig Taborn and multi-faceted percussionist Ches Smith, both American. This was the first time the latter has recorded with the bassist while Evans first joined forces with Holland in a 1968 free improvisation session for John Stevens/Trevor Watts’ Spontaneous Music Ensemble. On the other hand, Taborn was one of the four musicians on the 2013 Prism CD. This comprehensive adventure consists of a double record mostly composed of improvised material - in duo, trio, and quartet configurations - selected from a two-day recording session. Except for three scored compositions, they entitled the 23 tracks with a code that indicates the instrumentation, the day they recorded it (Tuesday or Wednesday), and which take. Smith’s “Thought On Earth”, the opening tune, achieves a state of meditative enchantment. It includes bowed bass, sensitive saxophone melodies, and sumptuous vibes. The quartet then casts around for tension before returning to the primitive form and texture. Prior to weaving percussive tapestries of varied intensities, Smith holds on to vibes until Taborn’s relentless voicings take their place. In turn, Holland brings his pizzicato wonders into the game while Evans’ contemplative lines are replaced with others of an untamed nature. The remaining written material consists of Holland’s tenaciously communicative “Q&A”, which first appeared on his avant/free jazz masterpiece Conference of the Birds, and Smith’s “Unsteady As She Goes”. If “Piano Bass Percussion T1” (trio configuration, recorded on Tuesday, first take) runs loose and sketchy in its cinematic ambiguity, then “Piano Bass Percussion T2” feels rousing as it continues to burst with a rough-and-tumble beauty until a bass pedal and steady pulse gives it a rest. “Tenor Percussion W2” is a perfect vehicle for Evans’ timbral explorations and Smith’s eerie sounds; “Piano Percussion W3” displays a rock-tinged strength in a brief yet vertiginous passage; “QT12” propagates an acute swing that favors the attractive eloquence of Evans and the twisty, hasty linear notes of Taborn, before shifting in rhythm; “QW2” also boasts an odd, grooving flux that comes appended with saxophone outcries, intelligent piano work, arco bass abrasions, and cymbal screeches. Moreover, it was great to listen to the gorgeous bass-percussion duets whose tangible grooves had an immediate effect on me. The entire program, manifesting the individual freedom and collective unity of four confident risk-takers, folds into amorphous figures, passionate interplay, and irregular trajectories pelted with rugged and decorous textures.